Mobile phones revolutionised Africa. From the simple ability to communicate or to access the Internet or online banking, today most Africans cannot function without one or more mobile devices. The majority of this access comes from satellites. In fact, I am writing this article from South Africa accessing the Internet using 3G via satellite. Satellites are an indispensable part of an almost unthinkable number of equations. However, despite the benefits that mobile phones have brought to Africa, most do not realise or comprehend what satellites and other aerospace technology can truly do to transform the African continent. Posted in News, Posts by PfAL members. In the light of the controversial security bill recently passed in the Kenyan Parliament and an estimated death toll of at least 370 in terror attacks in Kenya since 2011, it is time to reflect on a strategy that will identify sustainable solutions for the chronic instability along the Kenya-Somalia border zone. Currently characterised by state failure, callousness of absent politicians, corruption, worrying refugee flows, humanitarian crises, human rights violations, racial profiling, radicalisation of Kenyan youth, and inability of the Kenyan government to guarantee security to its citizens, the unconventional ebb and flow of armed conflict dynamics, implies future attacks will no doubt follow. Ahead of the unveiling of the Sustainable Development Goals in September 2015, LSE’s Donnas Ojok analyses the development projections of The Gates Foundation. Every year, Bill and Melinda Gates, the world’s richest couple and co-chairs of the world’s biggest philanthropic organisation, the Bill and Melinda Gates Foundation produce an annual report. The 2015 Annual Report is a unique one because the couple makes a second big bet after their first bet in the year 2000 which focused on health and education. Their bet concludes, “This new century brings with it exciting advances in health and learning. We all share the responsibility of ensuring that these opportunities are not out of reach for the people who need them the most”. That same year, world leaders made a pledge at the Millennium Summit in New York and the Millennium Development Goals (MDGs) were birthed. In the year of their second bet, the Sustainable Development Goals (SDGs) will be also come into being. For the full article, please visit the Africa at LSE blog. Is social entrepreneurship the magic bullet for African development? Social entrepreneurship now takes centre stage at global forums, like at the recent meeting of the World Economic Forum. From big European cities to small African villages, social enterprises are springing up and daring to address some of the most daunting challenges of our time. Indeed, “It is now becoming cool to make a difference,” noted Tim O’Reilly. Its proponents argue that social entrepreneurship presents a plethora of opportunities which, when exploited, will lift millions of people out of the so-called poverty trap. Critics, however, point out that the unavailability of appropriate market incentives, which is a common characteristic of most social enterprises, might actually limit their potential to sustainably solve development challenges. Regardless of which side one takes, these debates provide insights into the social enterprise concept in general, as well the search for solutions to Africa’s poverty challenge in particular. Read the full article on the LSE Entrepreneurship blog. In a remote corner of south eastern Guinea, the lush green highlands of Simandou are at the centre of a transformation being felt all over Africa after the discovery of one of the world’s richest and most coveted repositories of iron ore, the core ingredient of making steel. Today multinational companies are competing for a stake in Simandou’s ore, with billions of dollars of investment in prospect. Together with recent landmark discoveries of natural resources in Ghana, Uganda, DR Congo, Kenya (now ranked Africa’s fastest growing economy), Ethiopia, Mozambique, and Tanzania and many more, Africa is standing on the edge of an enormous opportunity in the global economy. But historically, these resources have often been more of a curse than a blessing leading to a variety of explanations for the failure to convert their natural resources into development assets. It is a reality. Climate change is here! Despite the grand arguments by climate change denialists, the time is coming when their views will no longer be able to stand. 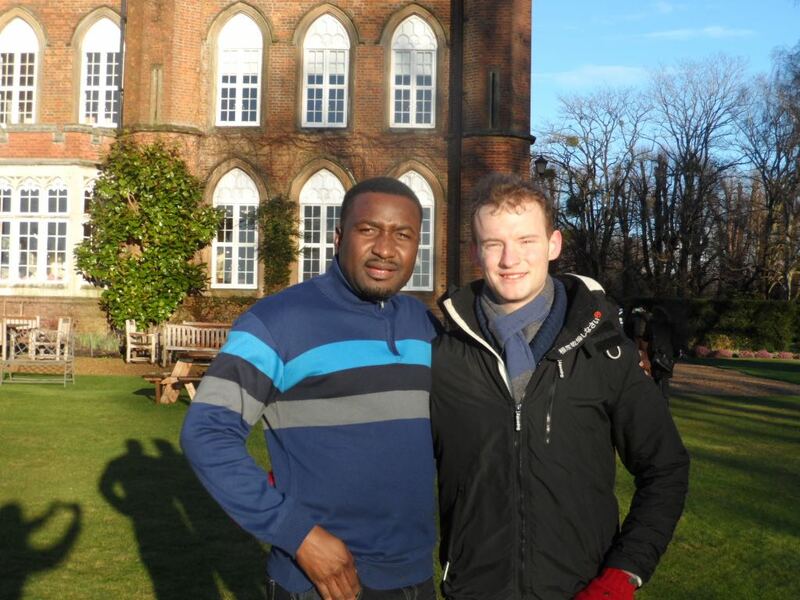 Though I am no skeptic, the grim consequences of climate change were made all the more plain during the Cumberland Lodge workshop in January 12-14, 2015, led by Professors Tim Dyson and Robert Wade. The weekend focused on Climate Change, Population, Disasters, and Grounds for Hope – a theme that was timely (right on the heels of the Copenhagen Conference in November 2014), interactive, eye-opening and highly enriching. The current debate about whether aid is good or bad for development has gained unprecedented momentum in the development and academic discourse. Aid enthusiasts like Jeffrey Sachs, Bill Gates, and Bono argue that the world is now a much better place because of aid. In his 2013 TED talk, entitled the “The Good News on Poverty”, Bono provides incredible stories of how aid has improved living standards in many African countries. On the other hand, critics like Dambisa Moyo argue that aid continues to increase dependency, widens indebtedness and promotes corruption. Drawing on my personal experience while growing up in the Karamoja region in Uganda, and later working on humanitarian and development projects in the post-conflict region of Northern Uganda, I feel compelled to shed some light on these ongoing debates. For the full article, please visit the Africa@LSE blog. September 2013 heralds the beginning of a new chapter in the development of PfAL. Having begun life as a three-week intensive education program, PfAL has now grown to incorporate a demanding LSE Master’s degree as part of a transition to a full-length (12-month) scholarship program. The success of the pilot program in March 2012 ensured a very high level of demand for places on the September 2012 program. Inevitably only a small percentage of applicants were successful; however, the level of interest and quality of applications resulted in the cohort doubling in size from 18 in March to 36 participants in September. Over the weekend of March 17-18, 2012, leaders from 13 African countries arrived in London to take part in the pilot Program for African Leadership (PfAL). The 18 participants hailed from Botswana, Cameroon, Gambia, Ghana, Kenya, Lesotho, Malawi, Nigeria, South Africa, South Sudan, Sudan, Uganda and Zimbabwe.